Cloud storage company Dropbox were hit with an outage on Friday. After several hours the file-sharing service blamed it on an issue that came up during regular maintenance. However a social network post allegedly from a hacker group 1775Sec and/or Anonymous had claimed responsibility for the outage. Dropbox have dismissed claims that user info had been leaked as hoax. 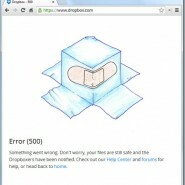 Some Dropbox users are still being affected by the outage, specifically, around 5 percent of users. They still can’t sync files from the desktop client, and 20 percent are having issues on mobile. A fix is rolling out soon to improve both those numbers, Dropbox says. Dropbox technicians have been making gradual progress on restoring service to affected users, but it’s reported via itsDropbox Support Twitter account that “not everything is working for everybody.”. Dropbox are said to be reintroducing features gradually, prioritizing basic access to all documents and adding the rest as time permits. Dropbox is actively responding to user requests for information and updates via its support Twitter. In a message to it’s business users via email, Dropbox reassuring it’s customers that files remain exactly where they left them, despite the lack of immediate access. As always GiraffeDog will keep you updated and let you know when full service is restored. We also recommend customers consider multiple cloud hosting platforms for their data. If you would like some friendly advice on this, do feel free to call us or email us.